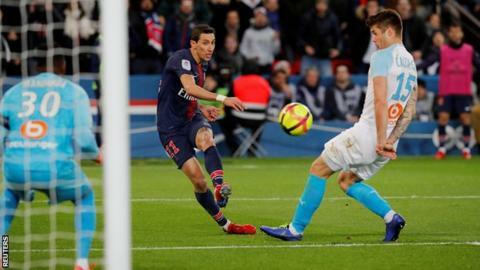 Angel di Maria scored twice - including a stunning 30-yard free-kick - as Paris St-Germain beat 10-man Marseille in Le Classique to move 20 points clear at the top of Ligue 1. Di Maria restored PSG's advantage with an angled strike past Steve Mandanda. Moments before the final whistle, Mbappe was brought down in the area by Hiroki Sakai, but the France striker's spot-kick was saved by substitute keeper Yohann Pele. Thomas Tuchel's PSG now have 77 points from 28 games, with Lille in second with 57 from 29 games. Match ends, Paris Saint Germain 3, Marseille 1. Second Half ends, Paris Saint Germain 3, Marseille 1. Penalty saved! Kylian Mbappé (Paris Saint Germain) fails to capitalise on this great opportunity, right footed shot saved in the bottom right corner. Penalty conceded by Hiroki Sakai (Marseille) after a foul in the penalty area. Corner, Paris Saint Germain. Conceded by Valère Germain. Attempt blocked. Ángel Di María (Paris Saint Germain) left footed shot from a difficult angle and long range on the right is blocked. Hiroki Sakai (Marseille) is shown the yellow card for a bad foul. Ángel Di María (Paris Saint Germain) wins a free kick on the right wing. Offside, Marseille. Valère Germain tries a through ball, but Nemanja Radonjic is caught offside. Substitution, Paris Saint Germain. Juan Bernat replaces Layvin Kurzawa. Attempt saved. Thilo Kehrer (Paris Saint Germain) left footed shot from the right side of the box is saved in the bottom right corner. Assisted by Kylian Mbappé. Substitution, Marseille. Kevin Strootman replaces Maxime Lopez. Thilo Kehrer (Paris Saint Germain) wins a free kick on the right wing. Goal! Paris Saint Germain 3, Marseille 1. Ángel Di María (Paris Saint Germain) from a free kick with a left footed shot to the top right corner. Substitution, Marseille. Yohann Pelé replaces Mario Balotelli. Steve Mandanda (Marseille) is shown the red card. Hand ball by Steve Mandanda (Marseille).